Systematic approach to food safety and proactive approach to identification of food safety hazards. Proactive preventative management system that complies with the Codex HACCP principles. Complements and strengthens quality management systems (QMS) and meets HACCP codex guidelines. Can be integrated with QMS. Increased confidence / customer satisfaction. We offer ISO 22000:2018 Awareness and Auditor Training presentation kit, which is prepared by a team of highly-qualified management professionals and experienced food safety consultants. This food system auditor training presentation slides are very useful while conducting corporate training within the organization or any work area. Our many clients have used it to train their employees during ISO 22000 certification. Our custom-designed PowerPoint presentation meets the requirements of effective food safety management system. 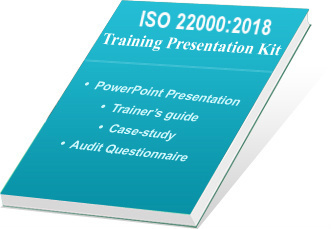 What Does ISO 22000 Auditor Training Presentation Kit offers? Workshop and casestudy to evaluate internal auditor training. The soft copy of presentation and handouts are given and one can edit it as per their own requirements. Handouts are written in MS Word and Presentation is made in Powerpoint. Developed under the guidance of experts and globally proven consultants having rich experience of more than 25 years in consultancy and training. User-friendly and easy-to-learn materials; one can add company logo as well as voiceover for the training of staff. Used by many companies for ISO 22000 implementation. Our kit gives total customer satisfaction as well as value for money. On successful completion of payment process at paypal.com, we provide username and password to download the product from our FTP server. Delivery of our products will be within 12 hours of payment confirmation by secure third-party payment gateway. View free Demo of Training Presentation Kit and Purchase complete product with secure online transaction via Papyal.com. Our products are used in more than 65 countries.